If there’s one thing I love about blogging, and sharing my quilts with others, it’s getting feedback from all you fabulous quilters. I asked for advice on the binding for my Jungle Quilt- and there were so many different opinions. I love that! Each of us think differently, and are drawn to different colors and patterns, and that is wonderful- especially because hearing your ideas helps me develop new ones of my own. It helps me to see my own projects through different eyes, and without my built in biases. Thank you! Tonight I met up with my 3 friends who are doing the Tula blocks along with me. Over munchies and drinks, we admired one new baby (so cute) and 4 sets of Tula blocks. We’ve all gotten through between 30-40 so far. And everyone is using 100% different color schemes. Mine, which you are over familiar with by now. K’s are soothing grays, beiges, and soft yellows. E’s are amazing, a collection made from scraps from many lines and many years, and S’s are all stunning batiks. I especially like the black binding on the back, as I feel like it really makes all those little monkeys pop. AND- it was my A Lovely Year of Finishes goal for May (Link #133- only 2 shy of being last), so, that’s all good as well! Linking up with ALYOF May Finish post, Finish It Up Friday, and TGIFF. Argh, triangles. The 1.5″ squares are not my friends. Block #39 was fine… my only regret is that the 2 sides of the cube are too similar. See? The colors looked different enough in the light when I cut them. But when the block was pieced, I no longer felt that way. 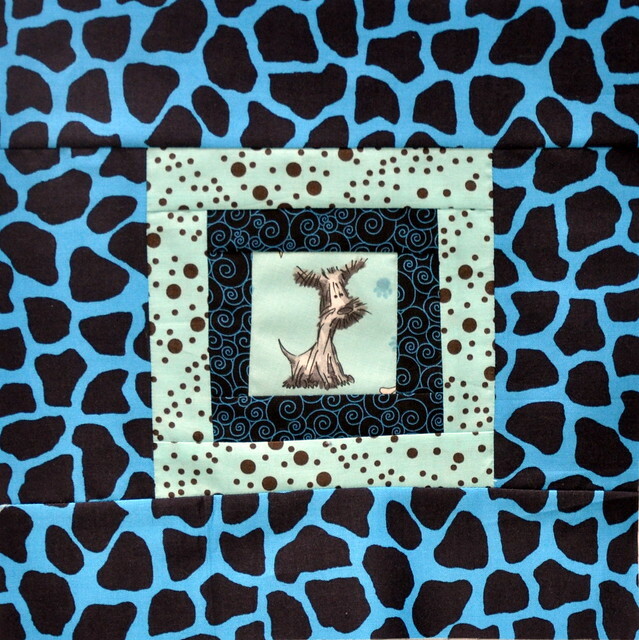 But, I am very happy with the way I made that Anna Maria Horner print work in the center of the block! Block #40 and I didn’t get along at all. I may go back and redo it. I am very, very happy with my fussy cut Fox Field centers. But… the green and lavender are way too different (which is funny, considering what I am complaining about in the previous block!) And my triangles are TERRIBLE. You won’t even have to look closely to tell. If I do redo it, I’ll replace the pale purple with a different, darker green. And probably even replaced the deep blue triangles. Maybe everything But the centers. What about you? Working on any Tula Blocks? Link up below if so! Hi, and thank you for visiting my humble blog 🙂 For my second entry to the Blogger’s Quilt Festival, I’m selecting the Large Quilts category. I made this quilt earlier this year, and it’s especially funny that it’s in the large category, as it’s a baby quilt… The fact that I simply didn’t process how huge this quilt was going to end up was a great source of chagrin/amusement to me. I picked the pattern because the mom and dad are VERY punk rock, and they needed a nontraditional baby quilt. And a nontraditional baby quilt they got! The pattern is in the book Dare to Be Square Quilting by Boo Davis. I had wanted to make it for years, and this finally gave me an excuse. You can read about the process here. This is one of my favorite projects ever. Aside from size, it turned out just how I wanted. And I made it at the end of a very long dry stretch- making it truly felt like a journey that helped my mojo return. The print greens all came from stash; I did have to purchase the solids. I bound it in purple batik because that made me smile. And I even did a decent job quilting it on my home machine. I did tight echo quilting inside the skull, funky spirals in the eyes, and radiating lines on the green section. 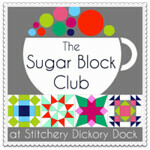 Thank you for visiting from the Blogger’s Quilt Festival! For the first time this year, I’m on the ball enough to enter the Blogger’s Quilt Festival, hosted by Amy’s Creative Side. I decided to submit it to the Scrappy category, as every block was made from stash scraps- except for the centers. 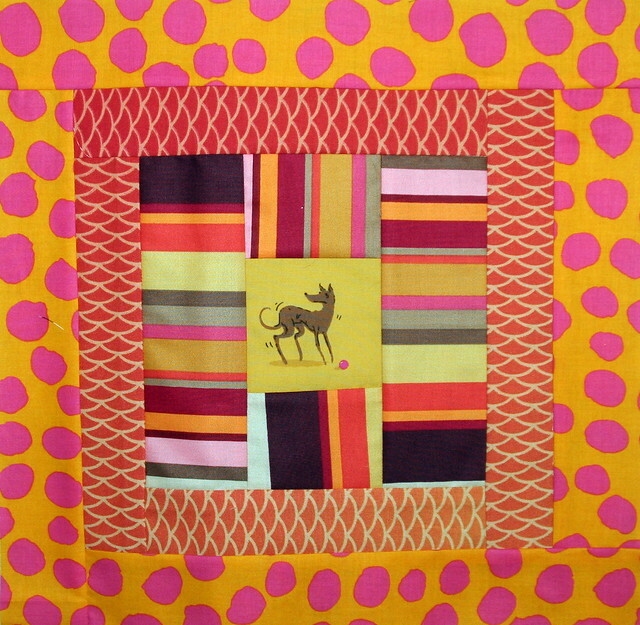 The center of each block is from a different piece of fabric featuring dogs. Many I bought myself, but other quilt bloggers sent me pieces as well. The fabrics in this quilt represent my tastes so very very well- mirror gal dots, kaffes, herringbones, batiks, and bold graphics- and color! Lots and lots of bright color! I intended this to be a gift for Annie’s 9th birthday, in 2010. We redid her bedroom that year, to make it more grown up- a desk for homework, bookcases instead of toy bins, etc. And we repainted from the purple I’d picked for her at age 3 to the blue she really wanted now. i actually made her an entirely different doggy quilt first- but I really wasn’t happy with it. (Apparently I was so unhappy with it I never took a photo of the finished top!) So I started over! 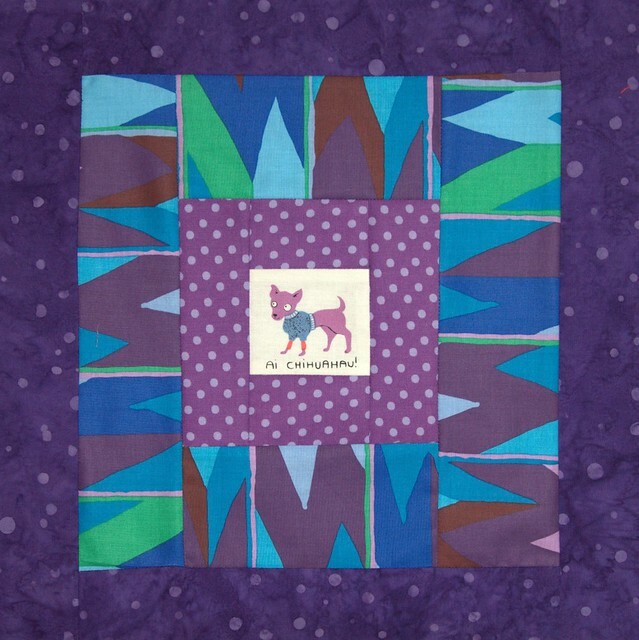 I approached each block as its own unit- picking the fussy cut dog for the center first, and then pulling fabrics for the block. I deliberately made each fussy cut center a different size, and tried to keep the surrounding fabrics to different widths. I chose 2 or 3 fabrics to complement each doggy. And for some reason, this process took me FOREVER. 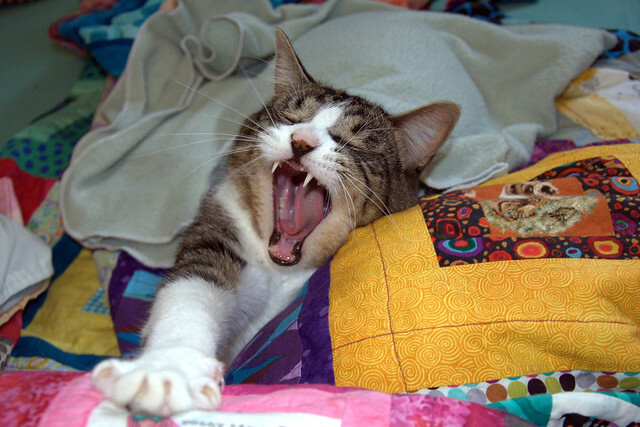 Annie did not get this quilt until Christmas Eve 2010, many months after her April birthday. The entire family seemed to approve. This purple one- I love the way the Brandon Mably fabric worked. This little blue guy, because I love how graphic and bold it is. And finally, this one, even though it’s super simple and more low key. Because when I was younger, we had an Old English Sheepdog named Spencer and he was the best.dog.ever. If you have any desire to check out all the blocks up close, you can check out this Flickr set of mine. They’re all there. Since I bought so many pieces of doggy fabric, only to chop up tiny bits of them for block centers, I used the leftover bits to create the back. I even used bits from the pieces I couldn’t make work on the front. The binding is a fun blue-green polka dot, I think a Michael Miller, that I also used in the curtains. I truly wish that my machine quilting skills had been better then- they’re only marginally better now, but I think it would have made a difference. I just did some straight line quilting, near the ditch. Probably not enough, actually. Still, she’s happy. And I do truly love this- it makes me smile every time I look at it. Each block was made with love, and each one is a combination of my favorite colors and prints. And on that note, I’ll leave you with some more photos. 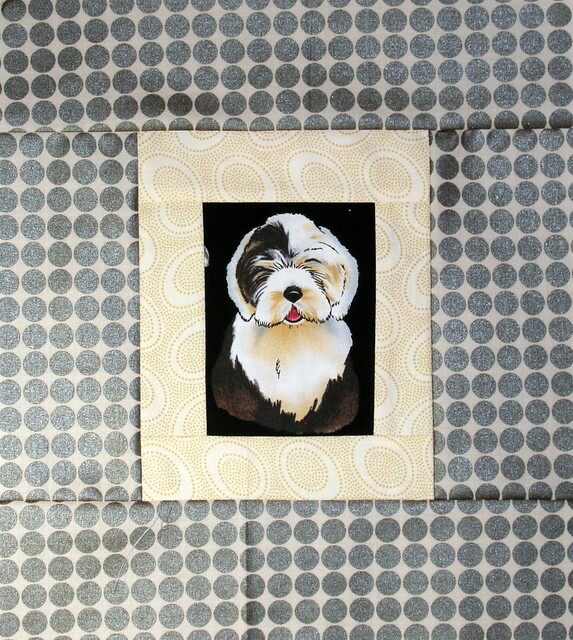 Thank you for visiting, and I hope the doggy quilt made you smile, too! I quilted it with a simple cross hatch design- I love it because there’s no need to mark the top- and it worked well with this pattern. I happened to have a spool of medium green thread sitting around, so, by default, that’s what I used. That way I didn’t need to make a trip to the store before I got started. On the black and dark green fabrics, it’s ever so slightly brighter than I would have liked, but it blends with the rest nicely. And it disappears into the back. My middle stripe isn’t lined up as perfectly as I would have liked- I thought I had it centered during basting, but not quite. I still think it works. What would you choose? I have enough of the solid kona green, the black batik with silver squares, both the giraffe and leopard prints, and also the olive green chevron-ish stripe. OR, I had originally thought maybe a bright blue solid, to pick up the blues in the parrots. Would a blue be too much, or just fun? Or, do you have a totally different idea? Please, let me know. I won’t have time to work on the binding before Sunday, but I am hoping to get it all done then. This week was 37 and 38- more of the triangles. Block 37 has some of my brand spanking new Anna Maria Horner Pretty Potent. I almost got the bird perfectly fussy cut… The outer border is a Kaffe Fassett shot cotton. I generally love them, but they are softer and more flexible. That makes me nervous- too much room for errors. Block #38 looks like it uses the same shot cotton, but it’s actually a blue solid. Much sturdier and less likely to cause piecing issues… And I worked back in my feature fabric. Neither set of triangles gave me trouble this week, hooray. Next week has some 1.5″ half square triangles coming up, so that should be fun. Do you remember a Sunday Stash way way back (okay, just back in March…I’m a drama queen) when I showed you some fabulous nerdy novelties? Meanwhile, my husband REALLY liked the fabrics. I don’t really want Star Trek on our bed, so I came up with another idea. I’ve long wanted to make place mats for the entire fam a la this blog post by Weeks Ringle. 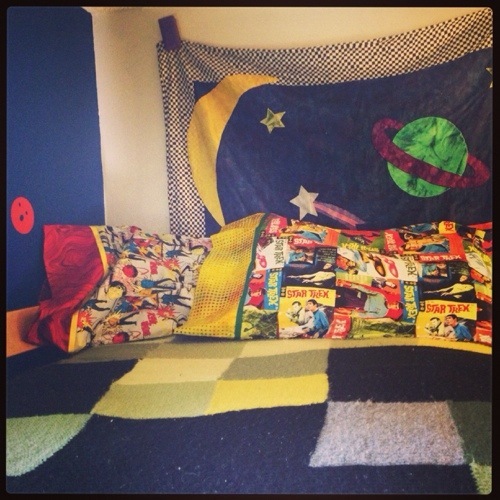 But then I thought, wouldn’t it be fun to have the kids help pick their own fabrics and sew their own slabs? (Thank you, Cheryl, for that term and technique!) And lord knows, we have enough bits of leftover novelty fabrics to make that very wild and fun. 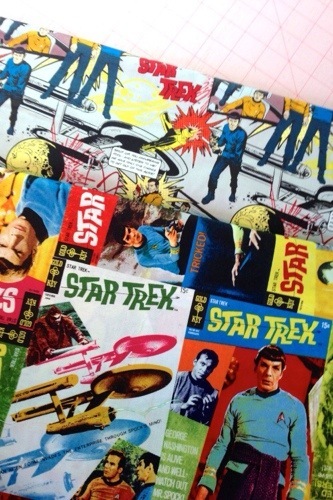 So Rich can have a Star Trek place mat, and our bed can stay matchy matchy, so, win win, right? Maybe we’ll even start that this weekend. Not a very original name, I know. Suggestions welcome! I took advantage of a snowy Mother’s Day, and then a snowy Monday home from work with a sick kid, to get cracking on my new baby quilt. I even got the back done. I *think* I could have gotten away with a solid back- I had enough of the jungle print left to pull it off. But I decided to use the leftover squares from the front and liven it up a tiny little bit. I’m hoping to get it basted and start quilting this weekend! 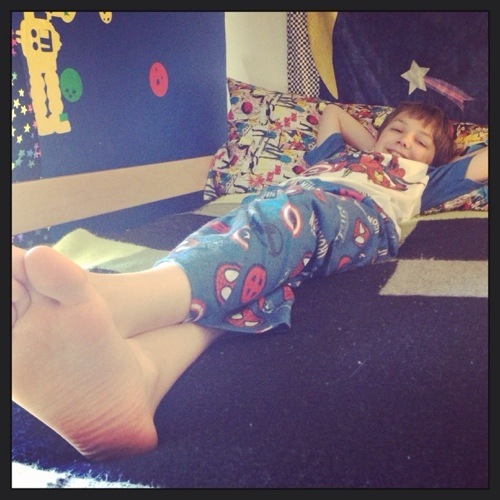 Meanwhile, linking up with WIP Wednesday and Let’s Bee Social.